The National Medal of Arts is an award and title created by the United States Congress in 1984, for the purpose of honoring artists and patrons of the arts. A prestigious American honor, it is the highest honor specifically given for achievement in the arts conferred to an individual artist on behalf of the people. 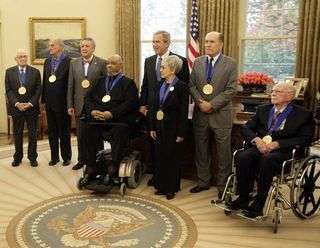 Honorees are selected by the National Endowment for the Arts (NEA), and ceremoniously presented the award by the President of the United States. The medal was designed for the NEA by sculptor Robert Graham. (patrons) The Texaco Philanthropic Foundation, James Michener, Philip Morris, The Cleveland Foundation, Elma Lewis and The Dayton Hudson Foundation. In 1997, poet Adrienne Rich refused her award as a protest against “inconsistencies” between art and “the cynical politics” of the Clinton White House administration. ↑ "Leonard Bernstein Refuses The National Medal of Arts"